The faucet is great. I The arch of the faucet is very nice. It is a great affordable faucet. Similar ones go for more at Lowe's. It looks great with our new sink. 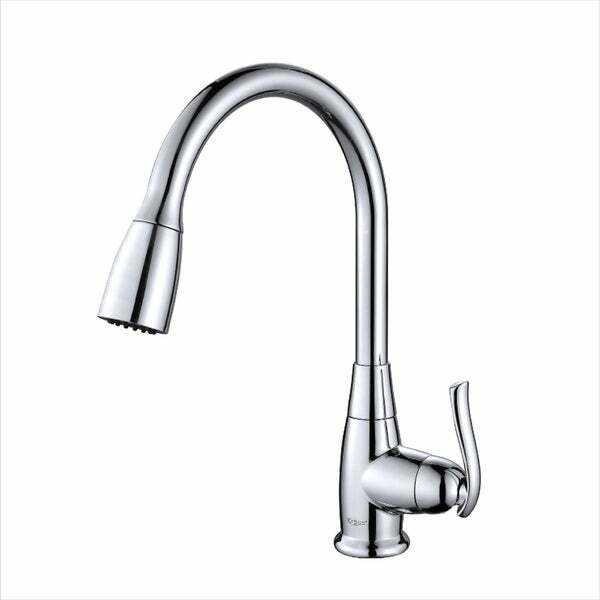 Design your dream kitchen with the Kraus high arch kitchen faucet. Constructed of solid brass with a pull-down sprayhead, this sleek piece adds to an elegant and intuitive space. The hoses on the underside used to attach the faucet to the house water supplies were way too short. They were only 4-5 inches long and the plumber said they are usually about 18 inches long. Also, it was not possible to attach one of the other elements to what it needed to be attached to without an adapter. It took the plumber 2 trips to the **** and 4 hours to install the faucet. I've used this plumber before and he is quite competent. I've bought many other plumbing fixtures from you before and this one was the first disappointment, but it was bad enough to make me wary of your products in the future. It should have been stated in the product information on your listing that it was a non-standard product and the variances described. I absolutely love this faucet. I like that it is easy to adjust the temperature, with just one handle. I also really appreciate that it doesn't show water beads like chrome ones do, so it stays looking clean longer. the pullout feature is great, and retracts nicely too. Overall, very happy! We love this faucet. It has styling you would expect to get from a high end model. The pull down sprayer retracts easily and is powerful. This faucet is great, nice high arch but pull out feature too! The oil bronze finish is really good. My husband had no trouble installing and I like it so much, I've ordered one for the kitchen! Purchased for kitchen remodel 2 years ago. It looks nice, but the pull out spout seemed flimsy. Water pressure coming out of the spout is weak. I thought it was a plumbing issue, but when I unscrewed the spout from the hose, the pressure is just fine. Then a couple of days ago (Thanksgiving Day), the spout completely stopped delivering any water. The sprayer mode is still functioning, but you have to hold the spray button down before turning the water on and keep holding it. Otherwise, it will not lock in place and stops the water flow. Hoping I can get a replacement spout and have the problem fixed. If not, I'll have to replace the entire faucet and will not be purchasing the Kraus brand again. Looks Great and worth the price. I bought this KRAUS Single-Handle Stainless Steel High Arch Kitchen Faucet with Pull Down Dual-Function Sprayer in Chrome and the quality was better than I expected. Fairly simple to install and it looks fantastic. My wife had her doubts but when everything was installed and working she simply fell in love with it. What more can I say. If you are looking to replace the kitchen faucet I would definitely consider this one. Super easy to install. I'm a 53yr old woman and definitely not a plumber!.If you have a logical bone in your body this is a piece of cake. Installed a bathroom faucet about 6 months ago had the same connection. 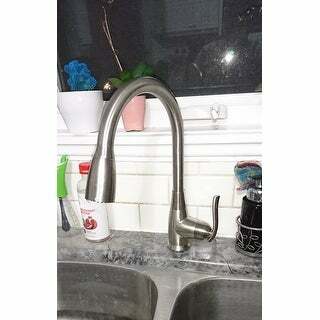 Seems that one connection is always shorter than the other.Just buy the right length faucet connector if not sure get the longer one,you'll just have a few extra inches for the water to travel.Most faucets will not be a perfect replacement to your old one,so getting faucet connectors is a must. Sounds like some people could use a new plumber! Came with coverplate which I needed since replaced a 3hole with this 1 hole.Nice bright chrome. Worst part was removing old faucet.Connecting this took 15 minutes tops. Didn't interfere with backsplash and love that it swivels.First time I put in a weight for the sprayer,no problem with those directions.Directions not clear about plastic and metal washer placement under sink above locking nut. Do not miss buying this by the reviews of how difficult some found this to be. Very happy I took a chance and bought this Kraus product. Well made faucet. Construction and finish of high quality. Easy installation and a terrific value. I bought this faucet and Kraus sink 9 inch deep. So much different from my old shallow sink with small faucet. I enjoy doing dishes, especially large cooking pods. Great quality too. Very happy with this faucet.Easy to install,very versatile and good pressure.I like it much better than previous pull out faucet.Happy over all with my purchase. 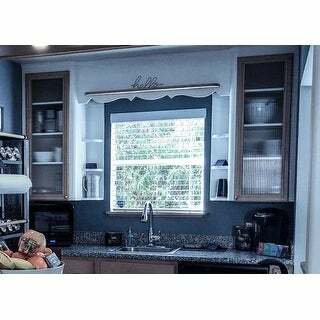 This upgrade to our kitchen helped bring the look together. The faucet is awesome, it can change from spray to stream & the pull down feature makes it so much easier to clean bg pots. I highly recommend getting the matching drains to complete the look. Bought one for my previous home and when I moved into my new place it only had a cheap faucet, but that didn't matter because I knew exactly what I was going to replace it with. Thankfully Overstock still carried this faucet, because just as the first one I absolutely love it. It's easy to install, has a very durable faucet head, excellent hose length and just works great. As others have mentioned the head is plastic, but I used the that one for 2 yrs without any issues and so far this one has been the same. I bought the faucet for my son. He is pleased with it. The first shipment there were missing parts in the box. I contacted overstock and the parts were shipped to us right away. Disappointed with this Purchase. Looks good but the pull out sprayer is difficult to use and doesn't easily snap back into place. We love our faucet, the bronze color compliments our kitchen sink, counter, and the room itself perfectly. It also works great! Great quality product for the price. Purchased along with a sink from Overstock for a newly remodeled kitchen. Looks wonderful with the copper backsplash. Great quality facet, modern designed, easy to install. This really is a great deal for a kitchen faucet . It’s has way more pressure than my old one easy install can’t go wrong . I definitely would recommend this faucet. The Sprayhead works for smoothly and retracts better than a very expensive Delta faucet I previously purchased. Also very nice looking. Very nice faucet. Perfect for my little kitchen. Easy to install and I love that it has brass firings. "Will the spray stay on by itself or do you have to continuously hold the spray button?" The spray will stay on by itself without holding the button in. Best faucet I have ever had. "Does this Kraus come with a soap dispenser?" "Does this currently come with a plate to cover a 3 hole sink? In the past, some answers say yes and some say no." This model does come with the optional deck plate. Yes it comes with a nice chrome plate that will cover three hole sink that is what mine was and the new faucet looks great. 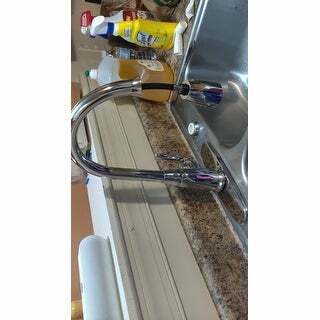 "I bought the Kraus KPF-2230 faucet and after 3 months, the lever has come off of the cartridge. I do not recall the lever being so easily removed and would like to know if there is a way to reattach the lever to the cartridge. Thank You, Mcolten"
"Is there any warranty with this faucet?" Yes, insert mentions limited lifetime warranty. I did not read it in detail. Quality of faucet is excellent. "is the head on this faucet plastic?" Metal. We have renovated a couple of home and used this faucet in both of them. Nice quality for the $. "How far does the faucet pull out of the stem part?"